'I'm A Great Admirer,' Obama Tells Pope Francis : The Two-Way The president and the pope met for the first time Thursday at the Vatican. While the two men share views on some issues, the church has some problems with the president's health care program. One leader whose popularity around the world has been eclipsed by the other met for the first time Thursday when President Obama visited Pope Francis at the Vatican. Obama, who has seen his approval numbers decline since he took office in 2009, met for about 50 minutes with the pope, who has become one of the world's most popular leaders since becoming leader of the Roman Catholic Church a year ago. 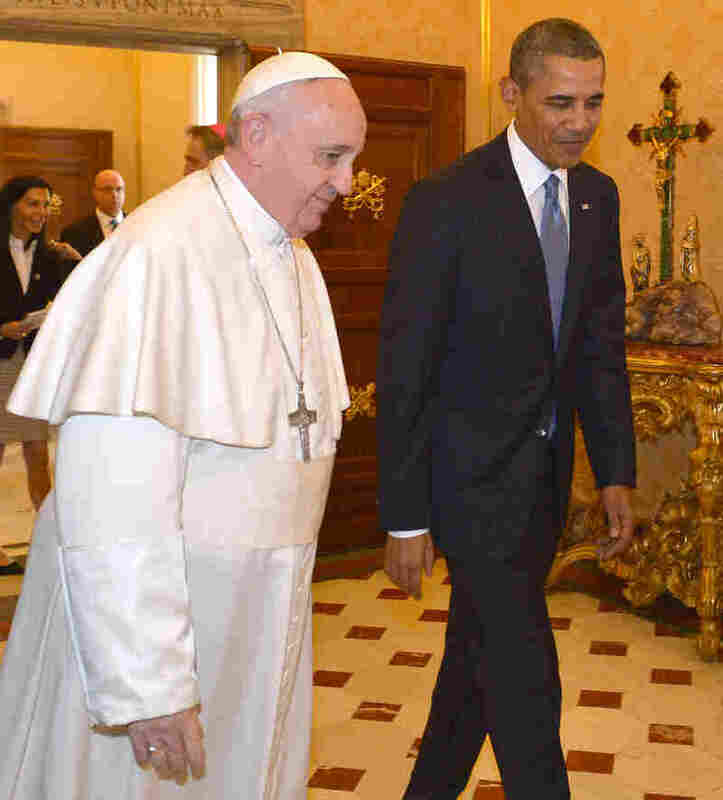 Pope Francis and President Obama at the Vatican on Thursday. It was their first meeting. "It is a great honor. I'm a great admirer," Obama said to the pope, according to reporters who were with the two men before the doors closed on their private meeting. "Thank you so much for receiving me." As NPR's Sylvia Poggioli said on Morning Edition, there was no official agenda for the meeting. But the two men were sure to discuss such global hot spots as Syria, Ukraine and central Africa, she said. Also, "an issue that's very important for the Vatican is the plight of Christian minorities in the Middle East," Sylvia said. One subject on which the pope could express some disagreement with the president is contraception and the provisions in the president's health care program that require some employers to provide insurance that pays for it. According to reporters traveling with Obama, the president presented the pope with a gift: "a custom-made seed chest featuring a variety of fruit and vegetable seeds used in the White House garden." The gift was inspired in part by an announcement earlier this year that the pope was opening the gardens of his papal summer residence to the public. "In keeping with the spirit of the gift, Thomas Jefferson's Monticello will donate seeds that will yield several tons of produce to a charity of Pope Francis' choosing." Pope Francis gave the president two medallions that symbolize "the need for solidarity and peace between the northern and southern hemispheres," writes Carrie Budoff Brown, one of the journalists in the "pool" that accompanied the president to the Vatican. The pope's other gift, she reports, was a copy of his Evangelii Gaudium, or The Joy of the Gospel. Among the things the pope calls for in that apostolic exhortation: a renewed focus on helping the world's poor. Obama told the pope he would read Evangelii Gaudium in the Oval Office. At one point Thursday, Obama joked that the pope "is probably the only person in the world who has to put up with more protocol than me."